Prophets, shamans, fortune tellers – the public has always been intrigued by psychics. There are so many abilities categorized as being of that paranormal nature, like clairvoyance, astral projection, pyrokinesis and so on, that as a source of inspiration the topic is practically boundless and the entertainment industry is still making use of this fascination. But it is, in fact, the real life stories that inspired the fictional. The world is full of opportunities for those wishing to get involved in the true psychic scene. If you have abilities of your own that need to be developed, guidance can be found in live groups or online on how to acknowledge and apply your craft. A simpler interest in divination services can be satisfied too. There are websites, for example, dedicated to listing professionals you can call or chat to over tarot readings on anything that bothers you, be it a professional, romantic or everyday concern. Psychic characters created for video games, books, TV shows and cinema are made memorable, if not legendary, thanks to their developers’ skill and dedication, but also to people’s desire to believe that such extraordinary gifts are real. As the protagonist of Nintendo’s 1994 role-playing game Earthbound, Ness is a boy destined to save the world from the evil Giygas alongside three other children. Apart from baseball bats and a yo-yo, the character possesses PSI abilities related to telekinesis and healing. He is also featured in Super Smash Bros. (1999) as an unlock-able character, his powerful combat moves, like PSI Magnet, PK Fire, PK Thunder and Meteor Swarm, making him a favorite among video game psychics. One of Marvel’s greatest psychic mutants is Charles Xavier’s son. Naturally… Since his debut comic book appearance in New Mutants #25 (1985), David Charles Haller’s immortalization has reached the small screen with Legion (2017). Dan Stevens has fleshed out the character, whose abilities – including but far from limited to telepathy, telekinesis, time and reality warping – are split between his multiple personalities, according to the original Marvel mythology. 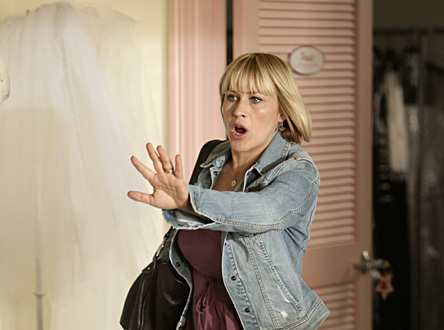 Portrayed by Patricia Arquette, the protagonist of Medium (2005-2011) has an ordinary family life, except for the fact that she is gifted and burdened with the power to communicate with the dead, which she uses to help solve crimes. As opposed to Legion, this TV series broaches the subject of paranormal abilities in a way that is more grounded and seemingly interested in both the psychic and normal experiences of mediums. In 2013, the third movie adaptation of Stephen King’s novel was released, starring Chloë Grace Moretz and directed by Kimberly Peirce. The story revolves around a shy teenage girl with telekinesis pushed over the edge by her peers, resulting in her unleashing her powers on her town to devastating effect. This is not the first or will not be the last of King’s literary repertoire to resurface on the small and silver screen, not to mention comic books and on stage. Regardless of which side of the topic you are drawn to, the thrills on page and monitor or those of the real world, the widespread knowledge, community and support available make exploring it that much easier and enjoyable.